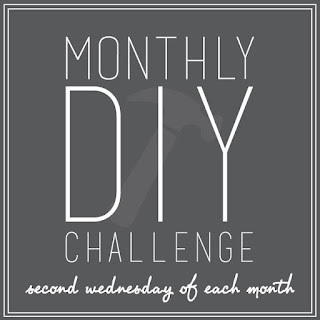 It's time for October's Monthly DIY Challenge! This month, my blogging friends and I were challenge to use craft wood which we defined as any thin pliable wood such as balsa, basswood, or thin plywood. It can be purchased at any craft store and even at some hardware stores. 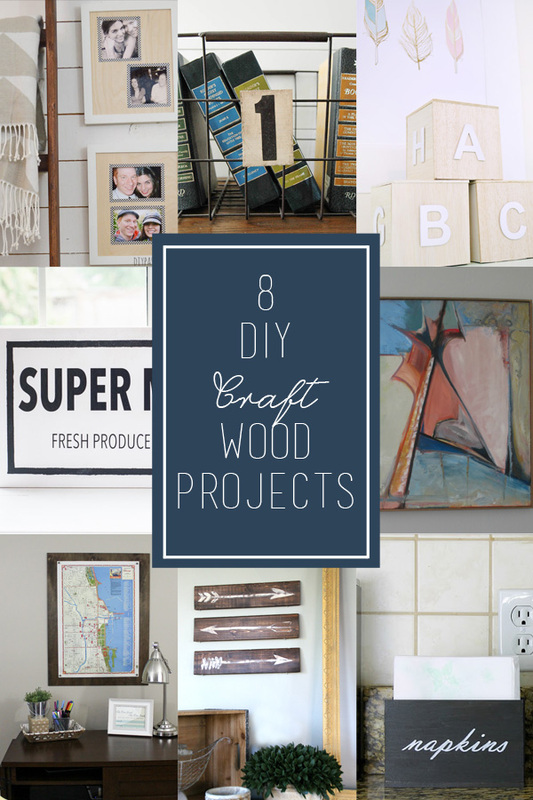 Check out the idea I came up with below and then see all my friends' projects near the bottom of the post! Want to learn more about our challenge and see all of our past projects? Click here! I've been on the hunt for a cute way to store napkins on the counter since we moved into this house! We have a chalkboard themed kitchen, and while I wasn't expecting to find a chalkboard napkin holder, I couldn't find anything that seemed to fit with our decor at all! When this month's challenge was craft wood, I decided to try to make my own napkin holder. First, I measured and cut the balsa wood. 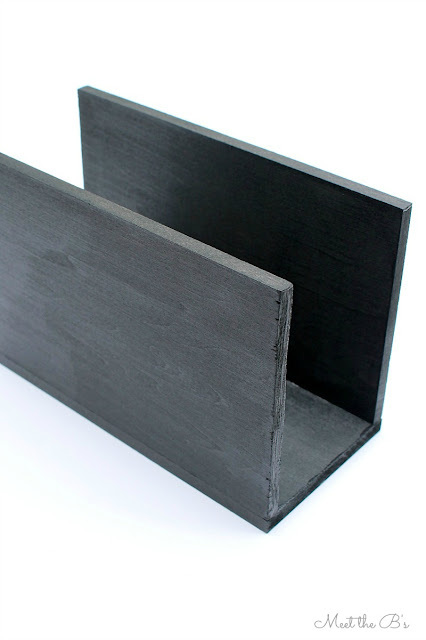 I cut two pieces of 4" x 24" x 1/4" balsa wood for the sides and one piece of 3" x 24" x 1/4" for the bottom. I made them all the same length. I just laid a napkin on one of the pieces and drew a line slightly past the edge of the napkin. Then I used that first board to mark the length of the other two boards. 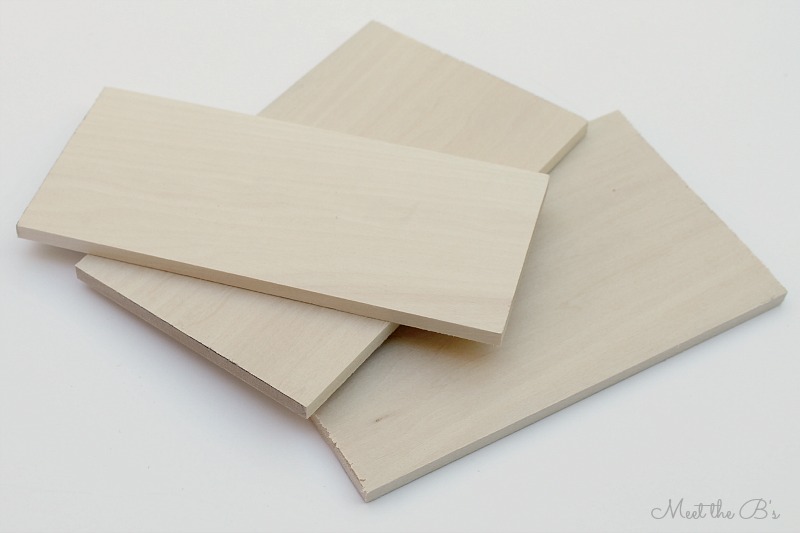 Balsa cuts fairly easily with a box knife. Then I glued the pieces together. I had never used Gorilla glue* before, but it was fairly easy to work with. It works via moisture, so I used a cup of water to dampen my finger and then ran my finger across the edge of one piece of balsa. Then I ran a thin strip of glue across the edge of the piece that would connect. I put them together and held them in place for a few minutes, until the glue got tacky. Then it stood on its own just fine. 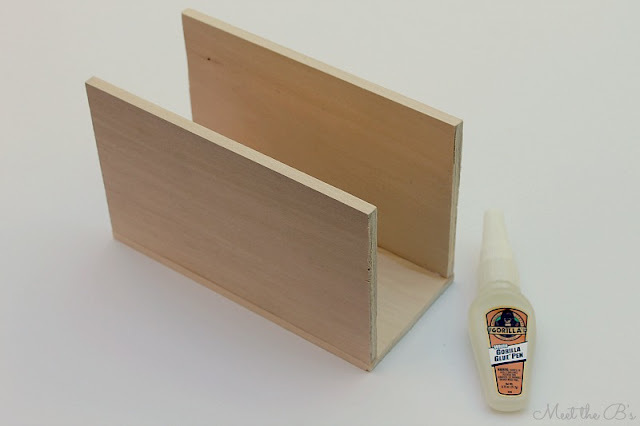 It takes 30-60 minutes for the glue to dry and cure completely. So walk away now and don't be tempted to touch it! After the glue dried, I gave the whole thing two coats of black chalkboard paint. * Let dry completely in between coats. If you plan to use it like a real chalkboard, you should let it cure for a day or two and then season it with chalk (rub the side of a piece of chalk all over it). I did let it cure, but skipped the seasoning this time because I wanted a clean look. Next, I used my favorite text transfer method to apply a pretty font ("Vladimir Script") to the front in pencil. To do this, follow the directions listed here. 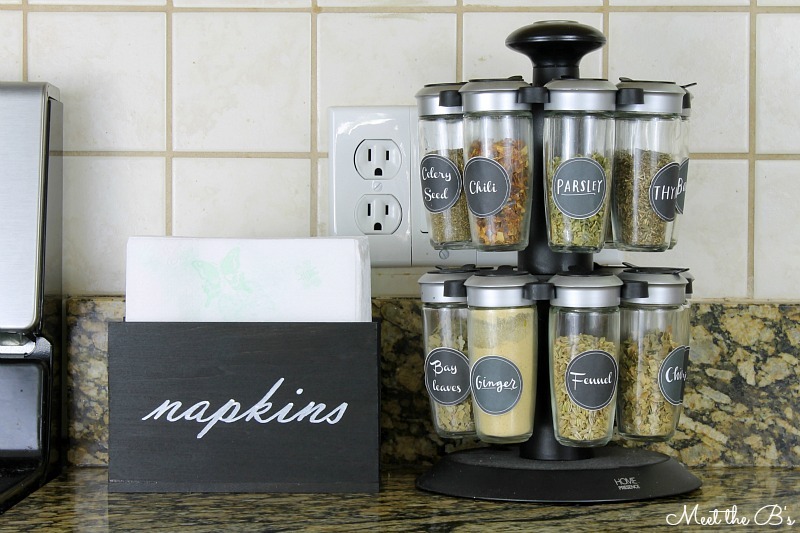 It looks great sitting on our counter and is exactly what I've been looking for to keep napkins in easy reach!!! *This post contains affiliate links. See my full disclosure policy. SUCH a cute (and useful!) idea! LOVE it Nicole! So cute, Nicole! It looks great with your chalkboard labeled spice jars. 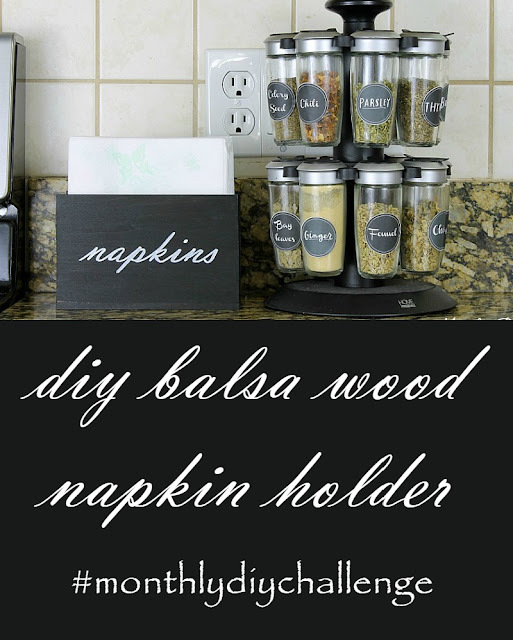 I always love a good DIY over store bought any day! This is ADORABLE!! I can honestly say I never would have thought to do this. Great work, Nicole! Pinned your project. Great idea! I'm definitely adding your transfer method to my list of ideas to try! This napkin holder is just adorable, Nicole! 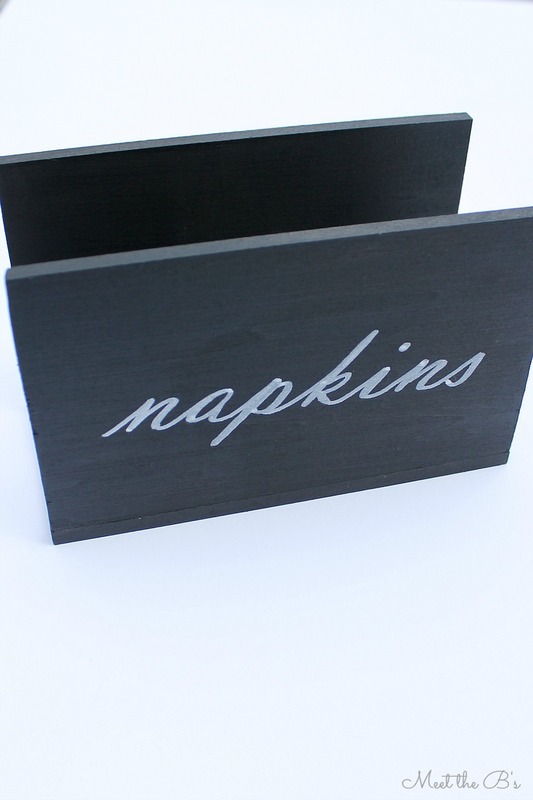 I love this napkin holder! I want to make one to hold my dryer sheets :) I have a couple of questions for you. First, where do you buy your balsa wood? I've never worked with it and after browsing the web, I am having a hard time finding anything that didn't come in a 10 pack. 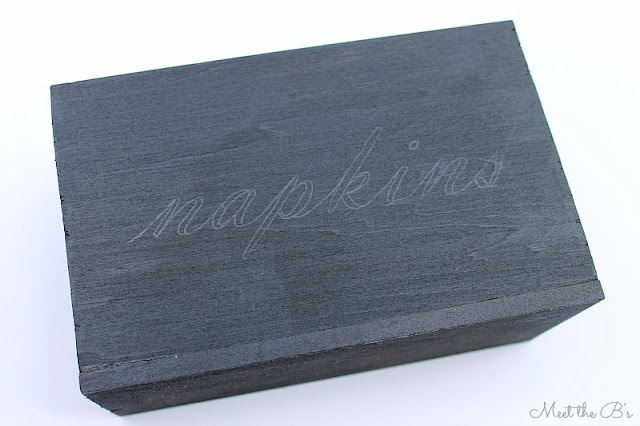 My second question is do you have a brand of chalk markers that you prefer to use? Thanks in advance!! !